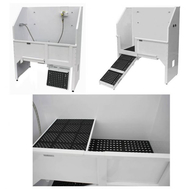 Edemco 48" Bather w/Ramp, Faucet, Floor Mat, Toy Rack, Cabinet. Pkg Deal! Edemco 48" Pet Tub w/Pull Out Ramp, Faucet Kit, Mat, Toy Rack, Pkg Deal! 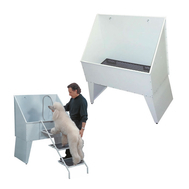 Groomers Best 48" Walk-Thru Tub w/Pull Ramp, Door, Faucet, Grate, Holder-Pkg Deal!